What we figured to be a quiet last week at Colonia del Rey RV Park turned into a scurry of activities. We completed a bunch of small projects that took longer than expected. On selling the house – inspections are completed, workers are busy fixing a couple of issues discovered during inspection. We are still on track for a closing in 30 days or so. One of the projects on my list was mounting a piece of metal art on a display board. 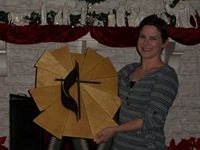 The metal art belonged to our pastor from St. Luke’s Methodist Church. That sounds simple enough unless you know I like complicated over simple. The 12 segments represent the 12 tribes of Israel (Gen. 29:31–30:24; 35:16-20), the 12 Apostles (Matthew 10:2–4), and the 12 heavenly foundations in the New Jerusalem (Revelation 21:19-20). 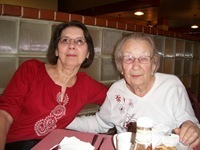 Saturday morning, we had our usual breakfast with Margaret and Margie. This has been a standing breakfast tradition for many years. Margaret is a CPA. She shares a home with her mom. While the relationship with Margaret and Margie began through Carol, it has grown through the years to include me. For the next 6 weeks, we will still be able to see them, just not weekly. Saturday was also moving day. We packed most of the RV on Friday afternoon to make things easier on Saturday. Slides in, stinky slinky, water and power disconnected, trailer hitched – we pulled out waving to friends as we left our site. 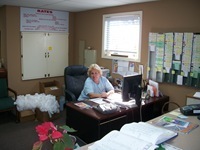 We stopped at the office to let them know our site was empty and gave Roxy a Poinsettia plant Carol had received. Roxy said they would plant it on the property. How cool, the Pearson Poinsettia has a permanent home. About an hour after we pulled out of Colonia del Rey we arrived at our new location – the overflow parking lot of First United Methodist in Odem, TX. That parking lot has hookups for 6 RVs. Our team will have a team meeting Sunday evening to discuss the work that needs to be done. We may be parked in Odem but we will be working in Sinton about 7 miles away because the work site in Sinton does not have hook ups. We will be working four six-hour days for the next three weeks.